Availability: Please Call To Get A Freight Quote - Lead Time of Approximately 1-2 Weeks! Please call to get a freight quote! This Product is Under Special Regulations and is solely for government use. Cannot be exported! 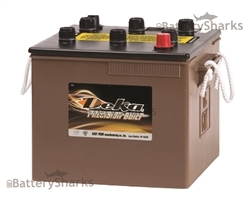 The genuine Deka 6TMF heavy duty battery is a rechargeable, wet cell sealed lead acid battery with absorbent glass mat technology (AGM) that guarantees an excellent performance in marine, auto/LTV, commercial, racing and powersports applications. The genuine Deka 6TMF heavy duty battery lasts up to three times as long as conventional batteries and delivers twice the overall power. The genuine Deka 6TMF heavy duty battery has a rugged construction with superior vibration resistance to prevent external corrosion and acid leakage. Please note that TWO of our genuine Deka 6TMF heavy duty batteries can be configured in parallel and can replace an 8D size heavy duty battery. If you need more help with purchasing genuine Deka heavy duty batteries, please call our Customer Service department at (800) 657-1303 or e-mail us. Buy your genuine Deka 6TMF heavy duty battery with confidence today! Orders for in-stock items are typically shipped within 24 hours. NOTE: This is a Heavy Duty Battery. The picture shown above is for illustrative purposes only. Do not hesitate to contact us if you need more information about the availability of a specific brand.